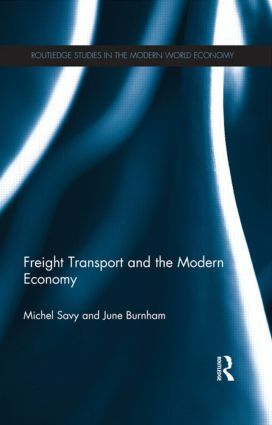 Freight Transport and the Modern Economy adapts a well-known textbook by Michel Savy, revising, extending and updating it for British, European and international readers. It deals not only with the technical aspects of transport, logistics and supply chain management, but also the interactions between transport professionals and the public authorities in the modern social, political, economic and environmental context. The transport of freight is presented as a system, mixing empirics and theory, showing how transport itself functions and also its strong influence on the modern economy, with a growing volume of production, turnover and employment. The nature of freight transport, an industrial process widely marketed as a service, is analysed in depth, explaining the main characteristics of the transport operation, its market and the regulatory context. The main actors, the professional actors (carriers, shippers and other agents) and the public authorities are introduced, and their behaviour and interactions are clarified. This comprehensive approach allows the reader to go further and consider in particular the approaches and practices of transport by carriers, customers, logistics managers, political decision makers and citizens, to tackle long range issues such as the ‘decoupling’ of production and transport recommended by some institutions and experts, and to explore the need for more infrastructure, or the capacity of the freight transport industry to reduce its contribution to pollution and climate change. This book treats freight transport as a whole system in its technical, economic, social, political and environmental context, in contrast to existing transport literature focused on individual aspects, such as transportation planning (usually for cars or passengers), logistics (essentially management issues), or individual transport modes. This book is comprehensive in its treatment of freight transport and in its use of multiple disciplinary perspectives.